He has served the Queen and Hillary Clinton, has worked on some of the best cruise liners like Queen Elizabeth II and Queen Victoria II, hosts cooking shows, and has travelled the world over to perfect the culinary arts. 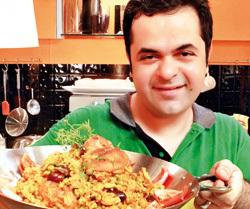 The immensely talented gourmet guru Vicky Ratnani digs out his 20-minute healthy recipe from his kitchen only for GP! Marinate the fish with the salt, pepper, olive oil and lemon juice. Cook in a non stick pan or bake in the oven for 10 minutes. In boiling salted water, blanch the mogri for 10 seconds. Then shock it in iced water to refresh. Drain and set aside. Season the broccoli and roast it in a very hot oven for 8 minutes or cook it the same way as the mogri. Mix the mogri and the broccoli with the fish. In a mixing bowl, toss all the ingredients for the salsa and serve with the fish. Fish lowers the cholesterol level and is a great source of Omega-3 and lowers the risk of heart diseases. Strawberries are seasonal, nutritive, delicious and are a great source of Vitamin A, B and C. Broccoli is an antioxidant and a good source of vitamin C, folic acid, calcium and fibre. Basmati rice has never been more sinful! 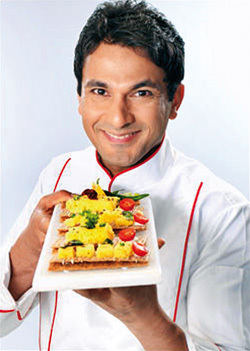 Owner of the Michelin-starred restaurant, Junoon, Vikas Khanna is the chef tagged as the hottest chef in New York. Deeply loyal to his roots, his dishes are surprisingly Indian yet have flavours to delight both Indian and Western palates alike. 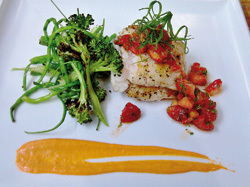 Exclusively for Get Physical, Chef Vikas dishes out a recipe for us from his cookbook Flavours First. Place the chocolate in a dry, microwave-safe container. Melt the chocolate in the microwave by heating it for one minute at half (50%) power. Remove from microwave and stir with a spatula. If the chocolate is not completely melted, put the chocolate in for another 30 seconds at half power. Stir and set aside to cool. Preheat the oven to 400º F. Coat the bottoms and the sides of six 6-ounce ramekins with 2 tablespoons of the butter. Sprinkle the bottoms and sides evenly with sugar. Tap out excess sugar and reserve for later use. In a medium saucepan, melt the remaining 4 tablespoons of butter. Stir in the basmati rice flour and cook for about 3 to 4 minutes, stirring occasionally, until the mixture begins to bubble. Add milk, melted chocolate and salt. Cook over medium-low heat until the mixture thickens, stirring occasionally, for about 5 minutes. Remove from heat and allow the mixture to cool for 10 minutes. Whisk in the beaten egg yolks and vanilla. In a large bowl, beat egg-whites with an electric mixer until foamy. Gradually add the reserved sugar, beating until stiff. Fold the egg whites into the chocolate mixture. Gently spoon the mixture into prepared soufflé dishes. I like to sprinkle a little extra sugar on top of the soufflés to make them a little crustier. Place the ramekins on a baking sheet and bake for 12 to 16 minutes or until puffed and browned. Serve immediately. Andrew Blackmore, friend and fellow chef, came up with the recipe by accident when he used my rice flour instead of all-purpose. Luckily he was in a hurry and didn’t notice the mistake. 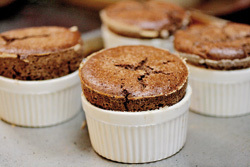 Andrew’s version of this classic soufflé is enhanced by the earthy flavour of the rice flour. Basmati rice flour isn’t always easy to find, to make it yourself grind the rice in a coffee or spice grinder then pass it through a fine sifter.